Citation: C N Trueman "Henry VIII and Scotland"
Scotland remained a source of potential trouble for Henry VIII for the duration of his reign. The fact that Scotland shared a common border with England was enough to make Henry very wary of his northern neighbour – especially as Scotland usually had decent relations with France. Henry did fear that France would use Scotland as a springboard for an invasion. 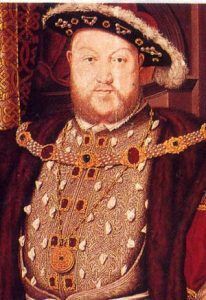 At the start of Henry’s reign, it seemed as if England and Scotland might have had the opportunity for a fresh start with regards to their historic relationship. James IV of Scotland had married Margaret, the sister of Henry. Henry had hoped that the new brother-in-laws might have a more positive relationship but he was wrong. James felt far more of a kinship with France – a friendship referred to as the ‘Auld Alliance’. In 1512 England and France were at war and James came in on the side of France. In 1513, he was killed at the Battle of Flodden. The new king of Scotland was James V – a seventeen months baby. There was every hope in London that his mother, Margaret, would take on the regency and develop far better relations with her brother Henry. Her marriage to the Earl of Angus led to a backlash by the Scottish nobility. Margaret was forced to give up the regency, which was handed over to the Duke of Albany. He was heir to the throne – but also very French in his outlook. Albany acted as effective ruler of Scotland from 1515 to 1524. It was a time of concern for Henry and Thomas Cromwell made it public that he believed that Scotland should first be subdued and then united to England. Henry wanted to steer a more diplomatic course while James was still a minor and he offered Scotland a sixteen-year truce in 1523 and the hand of Mary for James – if they kicked out Albany. The Scots nobles refused to do, which resulted in an English army attacking the Borders in 1523. In 1524, Albany sailed for France and never returned to Scotland. James was now free to act as king and his court developed a more positive attitude towards England. For a while England and Scotland enjoyed more cordial relations. The defeat of France at the Battle of Pavia in 1525 had reduced her military standing in Europe. The relatively positive support of Francis I for Henry’s divorce also meant that the king had less reason to fear Scotland being used as a base for a French invasion. Ironically it was marriage that was to spark off further difficulties for the English king. In 1537, James married Madeleine, the daughter of Francis I. However, the marriage was short-lived due to Madeleine’s early death. James then married Mary of Guise. This renewed his relationship with France and caused great concern in the Royal Court in London. While Henry was determined to pursue a policy of neutrality where possible in mainland Europe, he was less sure that this was a viable possibility with regards to Scotland. In 1543 Henry wrote “A declaration of the cause of war with Scotland” in which he justified why war against James V was just and why England had a right to subdue the Scots. With a typical lack of tact, he called the kings of England “superior lords” when compared to the kings of Scotland. He also made reference to 1541 when he had travelled to York – a considerable distance from London – to meet James in an effort to restore positive relations with Scotland, but that the Scottish king had failed to turn up. The Habsburg-Valois Wars almost always meant that Francis was more preoccupied with Charles V than he was with exploiting the pro-French feeling in much of Scotland. This situation played into Henry’s hands. When it was clear that James V could not fall back on French support, he was vulnerable to pressure from London. In the summer of 1542 when Francis was at war with Charles, Henry ordered the mobilisation of the northern levies. He then demanded that James come to London or York to sign a treaty of friendship. The refusal of James to do so led to open war in October 1542. The Scottish army suffered at the hands of the English army at Solway Firth in November. In December James died from natural causes. The new monarch was his six-day old daughter Mary. Henry was in a position to exploit the Scots weakness. He had a major supporter in the Earl of Angus. He also, in a gesture of friendliness, released all those Scots captured at Solway Firth. He even talked about a future marriage between Edward and Mary. However, he overstepped the mark when he called for the Scots to pay homage and fealty to the King of England. This seemed to be a direct attack on all things Scottish. The supporters of France in Scotland gained a second breath and Henry’s attempt to assert his authority over Scotland was lost. In December 1543 the Scottish Parliament abrogated the treaties it had signed with England but reaffirmed those Scotland had signed with France. Henry sent the Earl of Hertford and an army to the Scottish borders. They destroyed whatever they could so that the region could not support a landing by the French if one took place in 1544. The show of force was sufficient for some nobles to swear allegiance to Henry. Others, including the previously loyal Angus, were appalled by the wanton destruction caused by English troops and turned to the French. However, Francis was too pre-occupied with Charles to help the Scots. In September 1545, another attack by the English on the Borders also destroyed crops and farms. To many Scots Henry simply wanted to starve them into submission. His desire to subdue the Scots and make them loyal to England failed dismally.